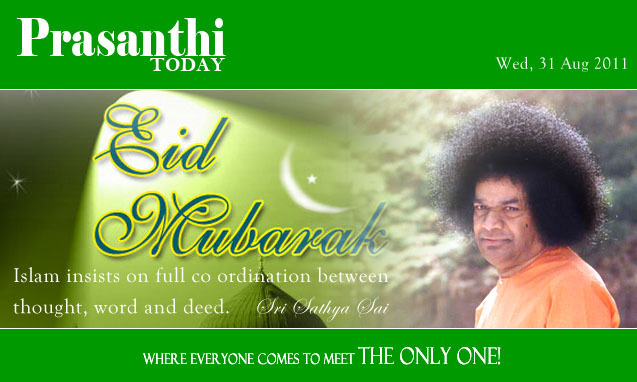 "Eid-ul-Fitr", or the festival of charity was celebrated in Prasanthi Nilayam today. 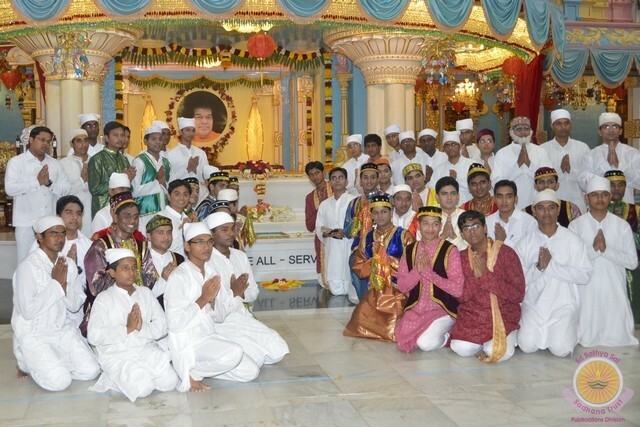 The students of Sri Sathya Sai Institute of Higher Learning perform educational and inspiring programme on this day every year and this year was no different. After the Vedic invocation, the programme started at 1700 hrs with Namaz, a prayer for the well being of one and all. After the Namaz, the students presented a skit with a story woven around the five pillars of Islam namely - Shahada (Faith),. Salat (Prayer), Sawm (Fasting), Zakāt(Charity) and Hajj (Pilgrimage). The importance of prayer was described with a beautiful song and dance. Fasting and charity with a story of sacrifice where a poor Muslim feeds a destitute boy with the food he was taking for his family to break their Ramadan fast., Faith and Pilgrimage was discussed by the students and their inner significance sought. Pilgrimage, they said, is not merely to be undertaken to a distant land but also toward the inward path. For the true abode of peace is within. The students then enacted an incident from their hostel life when two students join an Islamic brother in the Ramadan fast. Learning about this a fourth student, inspired by their sacrifice and resolve, would wake up very early and prepared a feast for them in the morning before sunrise. The students concluded the programme stating that Islam is not a religion, but a state of mind, a state where the mind is surrendered to Allah, the Almighty. The programme was interspersed with melodious music and energetic dance performances based on the teachings of Bhagawan and the Holy Quran. After the programme, the students sang Bhajans for 10 minutes after which Arati was offered to Bhagawan. Prasadam was distributed to the assembly. "My Life is My Message" is probably the most powerful quote of Bhagawan who always lived His life as an example for humanity. Respect to the mother, motherland and mother tongue were among the high principles He practised and taught. Therefore,, Bhagawan always encouraged His students to learn the folk arts of the land. Burrakatha sessions in Prasanthi hold a special significance, as, on most occasions, it is Bhagawan who 'demands' the same, selecting the theme and title by Himself. Ever since it’s grand entry into the precincts of Prasanthi Nilayam, this popular folk art of Andhra Pradesh has earned the status of ‘Divine Folklore’, earning the attention and grace of Bhagawan. The Burra Katha focuses on presenting serious matters in an easily understandable manner with a touch of humour. It consists of three artistes, one the Kathakudu( Story Teller), the Rajakiya (Political Analyst) and the Hasyaka (Humourist).The trio, students from Sri Sathya Sai University, Sai Prabhakar, Aravind Sai and Sai Raghuram (Post Graduates of the University), blessed to be the ‘originators’ by being the first batch of Burra Katha students, have been displaying their skills in the distinctive art with constant blessings, guidance and encouragement from Bhagawan. Prasanthi has witnessed number of such Burra Katha sessions over the past three years, enacting epical incidents in the Divine presence. The trio have been trained by Mr. Krishna Bhaskar from BHEL who had the rare blessing of conducting Burra Katha sessions for Bhagawan during the early years. This evening, the students decided to perform on the theme "Yugaavatar Sai". Recounting the blessing of being His contemporary and playing a small role in His mission, the students narrated the blessed story of the Lord's Advent and His matchless splendour. The presentation was extremely beautiful gently taking the audience through history - His Story with well timed comic interludes, astute interpretations and melodious songs. The programme concluded at 1800 hrs. followed by Bhajans and Arati. Prasadam was distributed to the assemblage. Srikakulam had an opportunity to continue their programme today with a Dance Drama entitled "Siva Leelalu". The presenter informed the assembly that Bhagawan has been blessing the Balvikas children for the past 5 years to perform in His presence. This year the children were guided by Sri Raghupatruni Srikanth, an internationally renowned Kuchipudi dancer. He has won over 8 Gold Medals in National competitions, performed in various countries including Singapore, Dubai and Sri Lanka and has been recognised by the Guinness Book of World Records. The programme started at 1630 hrs with Vedic Recitation. The coordinators offered rose to Bhagawan before the commencement of the Dance Programme at 1700 hrs. The children dressed vibrantly in Peacock Blue, Gold and White started the programme with a dance on Lord Ganesha to the tune of "Ekdantaya Vakratundaya" followed by a paean in the praise of the Lord of Prasanthi, "Sharanam Sharanam Sai". The backdrop changed to a photograph of a Shivalinga even as the song Sada Shivudu Vandanam heralded the arrival of Lord Shiva who danced the Thandava with His consort Parvathi. As the song continued we had the heart wrenching scene of the tribal devotee of the Lord, Bhaktha Kannappan, offering his own eyes to the Lord, in his innocent devotion. This song was followed the inspiring demonstration of Shiva conquering the God of Desire and the auspicious scene of the holy wedding of Parvathi and Shiva. The last presentation was a song dedicated to the Mother in her protective form of Kali. After the initial invocation, the annihilation of the demon Mahishasura by Goddess Kali was demonstrated. At the end of the programme, all the participants were gifted clothes. The teacher was specially honoured with a shawl. Bhajans commenced at 1750 hrs and Arati was offered at 1805 hrs. Prasadam was distributed to the entire assembly. 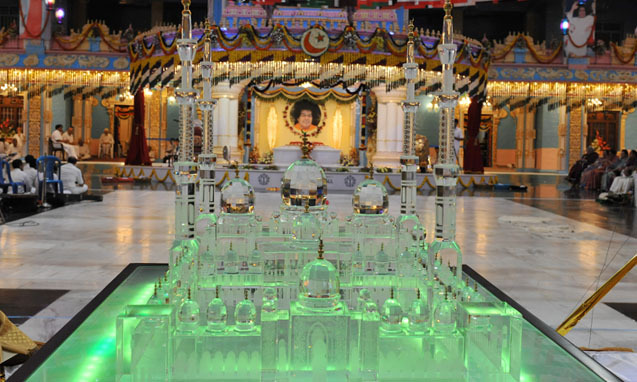 Serene touch of Bhagawan Sri Krishna engulfed the Sai Kulwant Hall this morning as Prasanthi celebrated the auspicious Sri Krishna Janmashtami in this Highest Abode of Bhagawan Sri Sathya Sai Baba, today. Going by the legends and historical records, it was last midnight, on the auspicious Ashtami, the eighth day of the dark half of Krishna Paksha of the month of Bhadrapada of the Hindu Calendar that Bhagawan Sri Krishna made His Divine Advent over 5000 years ago. For Prasanthi, the day used to be very special with Bhagawan Himself used to take the lead, celebrating the festivity reminiscing His days as Bhagawan Sri Krishna. This morning, Sai Kulwant was resplendent with rich colourful decorations befitting the occasion. The programme commenced at 0830 hrs. 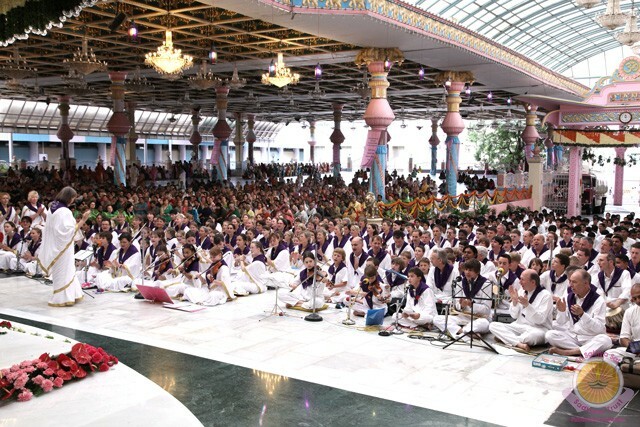 , after half-an-hour Vedam chanting, with boys offering a medley devotional songs at Bhagawan’s Divine Lotus Feet! Singing Pandurangashtakam first, next to come was a Hindi song reflecting Radharani’s passionate plea to Lord Krishna, calling Him to come out of hiding, “Pattu Paduma Krishna…” a favourite piece of Bhagawan, a fervent loving prayer to Krishna to sing a song. 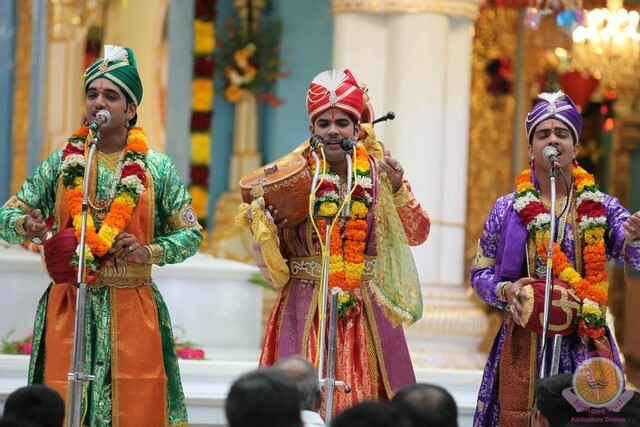 A carnatic piece, “Sri Venkatesham …” glorifying the significance of Namasmarana in Kali Age followed and as the song was on the Gokulam procession of cows and quadrupeds arrived at the Mandir. Two boys in the guise of Sri Krishna and Balrama joined the scene along with senior officials feeding the cows and quadrupeds. The procession was led by the Nadaswaram Band from the Institute, Vedam and Bhajan troupes. Songs continued and a group of dancers soon took the centre-stage gracefully dancing, depicting the Krishna Story in essence. Madhurashtakam was the next that was followed by another three songs, the final one being the popular bhajan that Bhagawan would often sing, “Muraligana Lola…” a prayer to Beloved Krishna to sing eternally through His devotees. A couple of bhajans continued before Mangala Arathi was offered at 0930 hrs. Prasadam was distributed to the entire assemblage. Tiny tots from the Primary School, who often got close proximity with Bhagawan during the occasion presenting their handiwork to Bhagawan greeting Him, made a beeline to the Sanctum Sanctorum at the end of the presentation, presenting their cards to Bhagawan, a touching scene for those who year after year witnessed the Bond of Love between Bhagawan and His students. Srikakulam, the pioneers of Parthi Yatra have arrived on their yearly pilgrimage to Prasanthi NIlayam. They were the group who started the concept of district wise holy trips to Parthi way back in 2001. The programme started with Vedic invocation by students at 1630 hrs. At 1700 hrs, the State Sevadal Coordinator, Sri R. Lakshman Rao with his poetic speech took a trip of nostalgia recounting the numerous blessings, the Srikakulam district has received from Bhagawan with special emphasis on the discourse given by Bhagawan in 2005, where He taught them the advaitic lesson of I am I. Sri Rao also gave a status report of the various projects undertaken in the district under Bhagawan's guidance. At 1715 hrs, Sri Bharati Ramesh & co. started their music concert. He was accompanied by G. Sai Eswari as the female lead, Srinivas and Ashok on keyboard, Venkat Rao on percussion pads, Sandeep Varanasi on Gitar, Surya Naryana on Dolak, Kalyana Chakravarti on Tabla and Taraka and Teja providing the chorus. Starting with a thundering rendition of the Ganesh sloka "Vakra Thunda"..., Sri Bharathi Ramesh cofessed his inability to enumerate the Lord's praises in the song "Yemmani Pugadethaiya", followed by the recounting of the Lord's Promise, "Parithranaya Sadhunam...". Ms. Sai Eswari sang an endearing number appealing to the Lord to come and speak once, "Ottesi Cheppava oka saari Swami". Sri Ramesh continued the performance with the songs "SaiRam, SaiRam, Sathya Sai Ram", "Sathyam Sivam Sundaram, Sathya Sai Mahamanthiram", "Anu Swarropama" and finally with an appeal to all to walk together singing the Glory of the Lord and listening to His teachings, "Sai Naama Vinura, Sathya Sai Bodha Vinura". The programme was followed by Bhajans. Prasadam was distributed to the assembly and Arati offered at 1815 hrs. A group of 126 from the Central European country of Poland presented a musical offering at the Sanctum Sanctorum of Sai Kulwant Hall this evening in Prasanthi Nilayam. The group that has come on a Sai Pilgrimage comprised of 35 gents and 91 ladies. The programme commenced just after 1700 hrs. after half-an-hour Vedam chanting. Beginning with a Ganapathi Prarthana, "Om Gananam Tva..." the group sang 18 songs in three languages, Sanskrit, English and native Polish.. Abba, Father, a song in praise of Heavenly Father picturising Jesus as the Dvine Son, Alleluya, a song in praise of The Lord, "There is a tone that sounds like a bell", a song on the Pranava - AUM, "Don't Worry, Be Happy", a song reflecting Bhagawan's assurance, were some of the compositions for the evening. The programme lasted for 45 minutes, ended with a song "Aum Santhi Aum...". For Prasanthi, it was yet another nostalgic evening, revelling golden memories of Bhagawan enlivening many such sessions in the past with His unmatchable physical presence. The group sang in great harmony, echoing His message of Unity, with great devotional fervour. Women choristers were distinct in their floral headband while the entire troupe was donned in white. The Choir was ably conducted by Ms. Maria Quoos. After the programme bhajans continued for another 10 minutes before Mangala Arathi was offered at 1800 hrs. Prasadam was distributed to the entire assemblage. Prof. Anantaraman, Media Co-ordinator, Sri Sathya Sai Central Trust thanked the group on behalf of the Trust, appreciating the programme, for their 'Voices of Unity'. He also announced about the arrival of a three thousand strong Parthi Yatra group from Srikakulam District of Andhra Pradesh that will be staging cultural programmes for tomorrow and the day after. Today is National Independence Day, 15th August! As the whole nation is gripped in patriotic fervour, commemorating the occasion, Prasanthi Nilayam, as she has been for past many years, once again got into celebrating mood joining the countrymen, commemorating the occasion in 'The Divine Presence!'. The schedule for the day was a drama presentation, in the evening, by the postgraduate students of SSSIHL, Prasanthi Nilayam campus. The presentation entitled "Aaazaadi - Inner Dependence" was a portrayal of India's independence, with flashbacks from the past, highlighting how two cardinal values, Truth and Righteousness strung together playing the vital 'chord' in the national Independence saga. Commencing with a dance of rejoicement celebrating Freedom, the Spirit of Independence made a guest appearance giving an intro to the programme, promising to take the audience through the story of Independence struggle. Two of the illustrious sons of India, Gurudev Rabindranath Tagore and Chandrasekhar Azad took the centrestage as narrators, taking the storyline with interlaced commentary showing flashbacks of illustrious lives and selected episodes. Raja Harischandra whose adherence to Truth and Righteousness, who showed exemplary character at the face of oddities, being strictly duty bound, Chatrapathi Shivaji whose courage, valour and love for Motherland made him an illustrious son of the land were illustrated before the scene shifted to a jail scene showing the trial and tribulations of the countrymen who were made to suffer at the hands of cruel British officers. The final scene was from the Mahabharat, where Pandavas in exile, make an attempt to fetch the forbidden fruit of Sage Romarishi and as a consequence while facing the wrath of curse from the Rishi, Lord Krishna Himself appears as saving grace... true reward for their constant contemplation and complete surrender. The presentation ended with the Spirit of Independence making a final appearance offering his salutations at Bhagawan's Lotus Feet. Narrating the symbolic link between Bhagawan and the Tricolour of India, the spirit went on declaring Bhagawan as the greatest patriot, at Whose behest and blessings the nation changed her course, winning independence from the British. As sonorous tunes erupting into an Aazaadi song echoed in the backdrop, the drama cast came forth, one after one, to the Altar, offering a "Flower Of Love" each at the Divine Lotus Feet! Indeed faces were full of emotions as memories of nostalgic golden days, where The Lord in physical would Himself bless these children, gushed forth engulfing the entire assemblage. After the one-hour presentation bhajans continued for another fifteen minutes before Mangala Arathi offering at 1845 hrs. Prasadam was distributed to the entire assemblage. Earlier, the session commenced at 1630 hrs. with Vedic Chanting for 45 mts. that was followed by bhajans for the next 15 mts. before the curtains unfurled for the "Aazaadi" presentation. WE WISH MOTHER INDIA A HAPPY INDEPENDENCE DAY! Today was a normal Sunday in Prasanthi Nilayam and Prasanthi was once again reverberated with the melody of Divine voice that came in the form of Beloved Bhagawan's recorded bhajan, a custom that has been recently introduced for Thursdays and Sundays. Refreshing the memory of India's Independence Day, falling tomorrow August 15th, students of Sri Sathya Sai Institute of Higher Learning will be staging a patriotic drama, Aazaadi tomorrow evening in the 'Divine Presence' in Sai Kulwant Hallat 1730 hrs. Former Chief Minister of Andhra Pradesh K. Rosaiah paid a visit to the Ashram this morning paying obeisance to Bhagawan at His Maha Samadhi. The green scarved army with the message of peace from the heartland of Islam gave its second presentation in two days in the holy precincts of the Sai Kulwant Hall. After the soul uplifting performance of the Whirling Dervishes of Turkey, the other devotees from the Region offered a beautiful musical garland to their Lord. Entitled "Sarva Devata Ateeta Swaroopa Karuna Sagar Sai" (which translates to My Lord Sai who is the ocean of Mercy and transcendental of all forms of God), the programme started with a brief introduction where in the narrator spoke about the unity of religions, the compassion of Bhagawan and the need to experience His love. At the end of the presentation, the group continued with Bhajans which was followed by the assembly with enthusiasm. Aarati was offered at 1800hrs. Click here for the full Report with Images and Video. It is Holy Month of Ramadan and a group of devotees from the Arab world is on a pilgrimage to Prasanthi Nilayam, the Ultimate Seat of the Divine. ...And on a pleasant evening, the Universal Mevlei Dance, an Islamic religious rite leading to spiritual bliss stole the limelight on the first day of the two-day scheduled Interfaith Programme by the visiting group from Region 94, in Prasanthi Nilayam. Bhajans followed for the next ten minutes before Mangala Arathi was offered to Bhagawan. Prasadam was distributed to the entire assemblage. Click here for the full Report with Images and Video. A pilgrimage by the Region 94 of the Sai Organisation comprising the countries from Middle East and Gulf has enveloped Prasanthi Nilayam with Islamic Fervor. 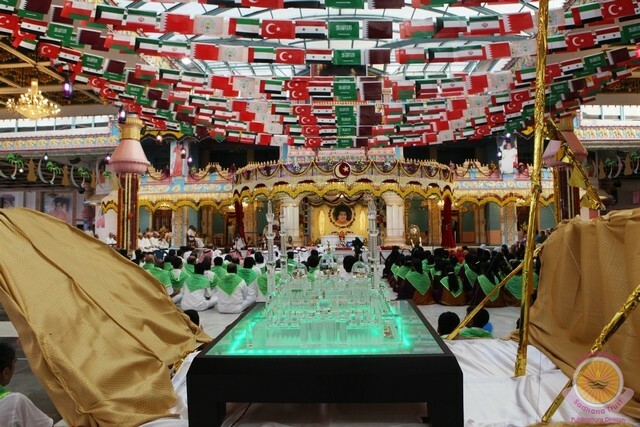 The group comprises devotees from Turkey, Abu Dhabi, Dubai, Sharjah, Kuwait, Oman, Bahrain, Qatar and Saudi Arabia.The portion of the Sai Kulwant hall in front of the stage is decorated with flags from all the participating nations. A crescent smiles atop the Sanctum Sanctorum. Teachings of Islam gleaned from Bhagawan's discourses flutters on the pillars of the hall. A large contingent of devotees in green scarves representing the colour of peace have been very active in Prasanthi Nilayam. Members of the group have joined the students for Morning Bhajans since August 7th. This evening it was announced that this group will be blessed to perform in Sai Kulwant hall on the next two days. The programme will include a procession of a replica of the holy mosque of Abu Dhabi. The programmes will begin at five o clock in the evening. They continued the programme with sacred verses from Zoroastrianism: 'Armaiti anahita, Ahura Mazda Tame Kare'.. This was followed by verses and songs from Buddhism: 'Budham sharanam gachami' and 'Om Mani Padme Hum'. Judaism was glorified with the piece 'Hevenu Shalom -Shabbat Shalom' and Christianity by the songs 'Dass Du mich einstimmen' and 'Agnus Die'. 'Bismillah' was their song on the glory of Islam. In other news, Thursdays and Sundays have become extremely special days in Prasanthi Nilayam this month since one Bhajan in Bhagawan's own voice is played to the delight of all devotees assembled in the hall. All devotees are blissfully able to follow the sweet voice of our most beloved Bhagawan. Meanwhile there is a large congregation of devotees from the Middle East in Prasanthi Nilayam now. They have decorated the Sai Kulwant Hall in Islamic style. They are expected to have cultural programmes the following week.